Joint Tenants vs Tenants in Common, what does it all mean? There are two ways to hold a property jointly, and they are as follows. Holding a property with another person as Joint Tenants, means that on the death of one of the owners, the property passes by survivorship to the other owner or owners, automatically. This happens without even looking at what that person’s Will says, or how the Intestacy Rules apply, if there’s no Will. Holding as Joint Tenants, means the property must pass to the surviving owners, whether they’re married or not, whether there’s tax to pay or not. It will pass, come what may (if there’s tax to pay, the practical implication may be that the property will need to be sold, but at least the survivor will decide how to pay the tax). Holding a property with another person as Tenants in Common, means that on the death of one of the owners, the property passes in accordance with that person’s Will, or if they don’t have a Will, the Intestacy Rules will be followed. Tenants in Common means that each owner has their own identifiable share of the property. This may be equal or unequal. They may each have very different ideas about where the property will pass in the event of death, or they may have the same ideas. 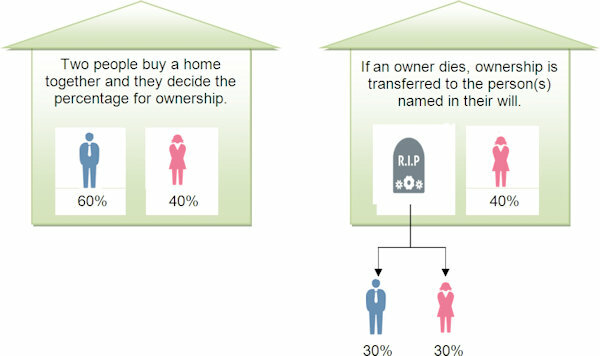 A traditional husband and wife will often hold their home as joint tenants, so that in the event of death, their home will pass to each other, even if they never get round to getting Wills in place. A “blended family” where each partner has their own children, may ensure their own “share” of the home is identifiable, by holding as tenants in common. This allows a specially drafted life interest in their Wills, to operate in relation to their “share” of the property, whether this is equal or unequal. This can protect their share of the property, so it’s guaranteed to pass to chosen beneficiaries such as their own children. If brothers and sisters own a rented property together, they may each want their own share to pass to their own spouse or children, so they hold as tenants in common. This may force a sale (or it might not, depending on the particular circumstances). A recently divorcing couple may have severed their joint tenancy, so that they hold what was their home, as tenants in common. This means that in the event of death before everything’s finalised in the divorce courts, they can have their own Will, providing for their children. Many families are watching their inheritance disappear whilst a family member is paying for care home fees. So long as the property is not sold, severing the joint tenancy and creating a Trust with the Wills is a simple, effective and, non-contentious means of being able to plan for future care home fees. Naturally, the above examples are provided to give you a flavour of how different the outcome can be, depending on how the property is held. It’s really important to take professional advice about your particular situation. It’s also really important to keep an eye on things when you move home, to ensure that any arrangements you’ve put in place when making your Will, are not scuppered by buying a new home in a different way, creating unintended consequences.